After work today, Lisa and I went to Broeder's Espresso off main street to put up my larger campaign sign. Broeder's has recently moved in and reopened the drive-through espresso stand on Main Street, and the owner told me after we retrieved the sign (the city took it down because it was on their fence; none of us who had posted there realized it was city property) that I could put the sign there. I ordered a large sugar free mocha from them while Lisa got out rope and zip-ties and tied it to their fence. This time we're sure the fence is part of the private property in question because we watched the fence being built last year after the previous tenant moved out and the owners made improvements. 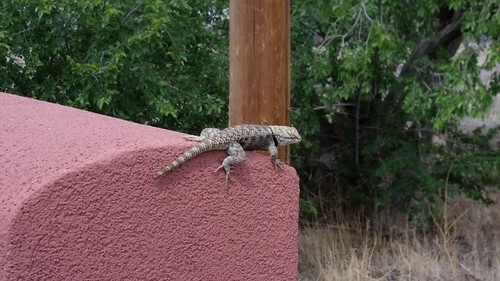 This lizard, which is similar to the one we shooed out of Fernley House a few days ago, was basking on one section of the fence. It's surprisingly difficult to match these lizards to descriptions, but this seems to be a kind of spiny lizard. It's not a "blue belly," which is smaller. There was another, smaller lizard also on the fence (it ran off before I could take the picture), but I couldn't tell if it was a different kind of lizard or just a smaller version of this one. Eventually Lisa got the sign secured and I got my coffee. I'll go get a photo of the sign when it's not pouring with rain.